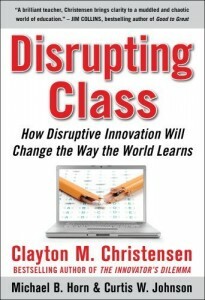 If you’re a teacher involved in the community of educators online, you may have heard of the book Disrupting Class by Clayton M. Christensen with Michael B. Horn and Curtis W. Johnson as co-authors. I decided to read the book after seeing Michael Horn’s keynote address at the VSS Annual Spring Conference last April. During his keynote, Michael introduced disruptive innovation theory and how it applied to current changes in education. I was intrigued by the combination of business theory and the field of education so, after being assured by Michael that the book wasn’t too US-centric for a Canadian teacher, I bought the book and have seen posts and articles about it online ever since. Their perspective hinges on the idea of disruptive innovation, which I’ll briefly try to describe (read the book, their description, with examples and graphs, is much better than I can do in a short paragraph). Disruptive innovation creates asymmetrical competition in any given market. A sustaining innovation, such as the public school system, is the industry leader providing certain services or products to consumers, whereas a disruptive innovation offers a product or service to non-consumers, thereby disrupting the market just enough to create change. For example, the high school where I work is small (less than 300 students) and there is no French teacher, but, in the last two years, French 11 has been offered as a Distance Learning (DL) course online. The DL course is a disruptive innovation offering an alternative for students who previously had no way to take the course. Overall, the idea is that new and emerging technology in the field of education is a disruptive innovation which offers an alternate to a standard education in the public system. Since many students struggle in school, disruptive innovation within schools may be the answer needed to help more students succeed more of the time. the book is well written and easy to read. I liked the writing style. individual learning styles are key. Howard Gardner’s theory of multiple intelligences is discussed. the authors’ acknowledge the importance of using technology in transformative ways. There’s no point in using a SMART Board as one would use a flip chart (an example of an adaptive use of technology – one where the new technology is used in exactly the same way as old technology and the learning that occurs is essentially the same). Transformative uses of technology actually change the learning that occurs by creating the opportunity for new things to be learned that couldn’t have been learned without the use of the technology (for example, a collaborative blogging project involving two groups of grade five students, one group in Canada and one group in Austalia, could not occur without the use of blogs and the internet). this is purely from a design point of view – I didn’t like the graphs in Chapter Two which helped to explain the theory of disruptive innovation. There are several 3D graphs, but it’s difficult to tell that they are 3D because they’re simple line graphs. Someone with a background in visual arts or design could easily add some tonal development to add form and depth, therefore making them look 3D. Is this U.S.-based book applicable to educators outside of the U.S.? Before I bought the book, I approached Michael to ask him this question. He was honest with his answer, admitting the book was based on research and statistics from the United States, but that the book was still applicable outside of the U.S. After reading the book I’ve noted many similiarities and differences between the situation in the States and Canada (specifically British Columbia), however, I definitely think that it’s worth the read no matter where one teaches. more and more courses are being offered online. Many districts have a ‘virtual school’ with a variety of online options for students to choose from. much less emphasis on standardized testing as compared to the U.S.
I’d like to know what the statistics are for British Columbia, Canada and other countries around the world. There are many interesting statistics in the book, for example, “by 2019, about 50 percent of high school courses will be delivered online” (p. 98) I’d like to know what the prediction is for Canada. And what about the projected stats for a country such as Finland which has an education system famous worldwide for it’s success? I don’t see how computer softare could be used to effectively and completely teach open-ended subjects such as art. I can see how computer software could be used by students to individualize their learning in a fact based subject like Math or Science, but what about Physical Education, or writing skills, or Dance? Well, that ends my book report! Have you read the book? What did you think? This entry was posted in professional reading and tagged Clayton Christensen, Disrupting Class, Michael Horn, online learning, VSS by egregory. Bookmark the permalink. Great summary of the book. I too was struck by how different the politics of education are in BC as opposed to the US. – This number has grown from 17,000 in the 2005-2006 school year. Those are pretty big numbers! Thanks for adding the fact sheet link and those statistics! I’d like to know what the projected timeline is for our province to have 50% of high school courses delivered online. Maybe I can figure it out with the formula in the book. Our district is doing some amazing projects with online learning. This year three teachers at my school will be doing Shared Instruction projects with teachers/students at other schools. There is a classroom equipped with Smart Boards and video cameras so that one teacher teaches to students in the room plus students in schools in other communities. There’s even a motion sensing camera so that when a student raises their hand the camera can zoom over to them so they can ask a question. It’s pretty high tech stuff and I’m interested to see how it all works out. That sounds like a pretty neat initiative! I saw something similar a few years ago in Kamloops; a History 12 teacher taught to a class of about 15 students in front of him and was linked up via satellite to a group of about 5 students in Logan Lake. Cameras were set up so that each class could see the other. A few times over the semester the teacher went to Logan Lake and taught from there. I wondered at the time how discussions between students from the two classes could be accomplished. I’m thinking that setting up discussion rooms on Elluminate might be a good way to get small groups of students from the different schools able to communicate with each other–they’d each need a computer though to log in. Lots of possibilities. I’d love to hear how the project works out at your school! Errin thanks for taking the time to post the report. I finally get it, ‘adaptive’ is bad even though it sounds good! As you know I am a believer in the power of digital technology to transform education. Hopefully connecting classrooms will be one small step in the process of discovering what works. Thanks for your post! Some insightful comments. I’m most intrigued by the differences between the U.S. and BC contexts. Where would one find numbers on the classes taken online in BC? If you want to work through this together by compiling the data, I’d be happy to collaborate on running it through the formula and figuring out the right assumptions and so forth. Maybe you’ve already got it moving, however, without me! Second, on the graphs — do you know someone who could help? That’s an intriguing suggestion. Actually, the public school system would be akin to the “incumbent.” The innovations that they make to improve their service in the way they are naturally structured to improve would be called the sustaining innovations. To be a bit confusing for a second, disruptive innovations actually have a sustaining element to them as well–after all, they have to improve, too! The initial innovation is disruptive if put in the right model, and then the subsequent improvements are sustaining in nature relative to it. Hope that makes sense! @ Ken – Have you read Bernajean Porter’s research on the different uses of technology? She describes the literate, adaptive and transformative uses of technology very well. Remind me to share the paper I have with you before school starts. @Michael – Thanks for visiting and I really appreciate the comment! I do want to find the BC statistics and I’d love your help! I’ll look into it and see what I can find. And I have a couple of talented people who may be able to help with the graphs. I’ll ask them and get back to you. Thank you also for the clarification. That makes much more sense!